Bow To Blood has the potential to be my most anticipated game for 2018. Even though I only played the game for about ten minutes, I walked away feeling really excited by the possibilities of the full game. The idea is that players will take the role of captain on the airship Freelancer and take part in ship-to-ship combat for fortune and glory in The Arena. Bow To Blood struck a powerful nerve with me because I felt like I was playing a hybrid of Star Trek Bridge Crew with the sailing portions of Assassin’s Creed 4: Black Flag. Moving the Freelancer feels really great--it’s not zippy as a starfighter nor does it lumber about like a huge capital ship like the Galactica. The maneuverability of the airishp strikes a great balance that makes it a dream to fly. The demo pitted me and another ship against a large, laser-spewing robot-thing. Before the challenge began, the captain of a rival ship gave me the choice to either team up with him and split the winnings or treat the spectacle as “every captain for themselves.” As this was my first time in the captain’s chair, I opted to partner up which allowed us to make pretty short work of the giant ocular behemoth without having to manage another airship taking potshots at me. The Freelancer is held together by AI crew members who are useful in mitigating any damage the ship sustains. You can command them by pointing the Dualshock controller towards damaged areas, causing them to scuttle off for a while as they patch things up. Crew operations extend to monitoring and diverting power to different ship systems but I didn’t get a chance to try those features out. The crew provides some fun banter and color commentary during the engagement which helps to keep the tone nice and whimsical. Firing the ship’s guns is as easy as holding down the trigger but as these airships operate much like the tall ships of old, you’ll need to aim with the broadsides to really unload on your enemies. At one point, my ship was attacked by small drones and because my cannons were too big to take them out, I had to pull out a futuristic revolver and blow them out of the air myself, which I thought was a really fun way to keep me engaged with the battle. At the end of the round, and the giant laser robot thing destroyed, the other captain asked me to honor our deal. Just for fun, I reneged on splitting the pot causing him to get more than a little angry. Before we had a chance to settle the score, however, another airship jumped in and started causing all sorts of chaos, an event that marked the end of the demo. The team on hand from Tribetoy mentioned that Bow To Blood was designed to be a story driven, single player game where the world is fleshed out by procedurally generated captains that cross your path. Each ship has its own personality and motivation for taking part in The Arena, which should result in a fun, colorful cast of characters. 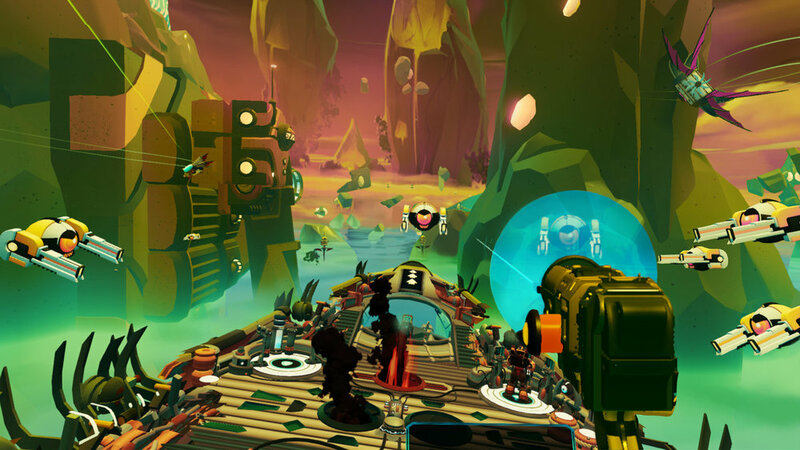 Bow To Blood made a really great first impression with its concept, beautifully vivid art style that’s reminiscent of Disney’s Treasure Planet, and design that takes advantage of the PlayStation VR. Out of everything I saw at the PlayStation Experience, this was the one game I couldn’t stop thinking about for the entire show. 2018 can’t come soon enough!